The Taylor-Johnson Temperament Analysis® is a widely used personality assessment for individual, pre-marital, marital, and family counseling. The T-JTA® measures 18 dimensions of personality (9 bipolar traits) that are important in individual adjustment and interpersonal relationships. The T-JTA® is used by thousands of counseling professionals in a wide array of settings in the U.S. and around the world to help people understand themselves and others in their lives. 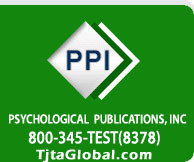 Founded in 1966, Psychological Publications, Inc. (PPI) is the international copyright holder and publisher of the Taylor-Johnson Temperament Analysis® (T-JTA®). PPI is committed to the highest level of professional and ethical standards. The T-JTA's accuracy and user-friendly design remains our top priority with ongoing research and product development. The T-JTA® was re-standardized for the U.S. in 2012, with 2012 Norms released in January, 2012. T-JTA Brief and Interpretive Reports, available through T-JTA Online Scoring Service and in T-JTA Computer Scoring Software, have been redesigned in content and format with new scales and syndromes. T-JTA® Online Scoring and Computer Scoring Software are designed to increase ease-of-use, save time, score and print plotted Profiles in color, produce Brief Reports and Interpretive Reports for counselors, and produce T-JTA® Report Sheets, Report Booklets, and Trait Suggestion Sheets for test-takers. PPI is also committed to T-JTA® training, offered throughout the U.S. and in numerous countries around the world to enhance and support effective T-JTA® usage. To meet the growing demand for use of the assessment around the world, the T-JTA® is now available in numerous translations. The most widely used translations are English, Spanish, French, German, Korean, and Chinese. These are available in print, in software applications, and in online test administration. At PPI, our customer's needs come first! We believe our personalized service is unique. Over the years, we have come to know many of our customers by name and enjoy the opportunity to assist you to determine which assessments and services best meet your needs. When you call PPI, you will greeted by a customer service representative who is here to help you, to answer questions about our array of assessments and related products and services, and to assist you in placing an order for T-JTA® or other materials. Our offices are located at 2205 First Street, Suite 110, Simi Valley, CA 93065. Please send any correspondence to our physical address. Our normal business hours are Monday through Thursday from 9:00 a.m. to 5:00 p.m. PST, and Friday from 9:00 a.m. to 4:00 p.m. PST. Our toll free telephone number is 1-800-345-8378 (U.S. and Canada), our international telephone number is +805-527-9202, and our fax number is 805-527-9266. Our email address is tjta@tjta.com. You will find a complete description of all our products in our online PPI Catalog. Rest assured that your orders will be handled safely and promptly with secure online shopping. For your convenience, your orders can also be placed by phone, mail, fax, or email. We look forward to another productive year of providing the T-JTA® and other valuable resources for counselors, clergy, and others in the helping professions to assist individuals, enrich marriages, and strengthen families.